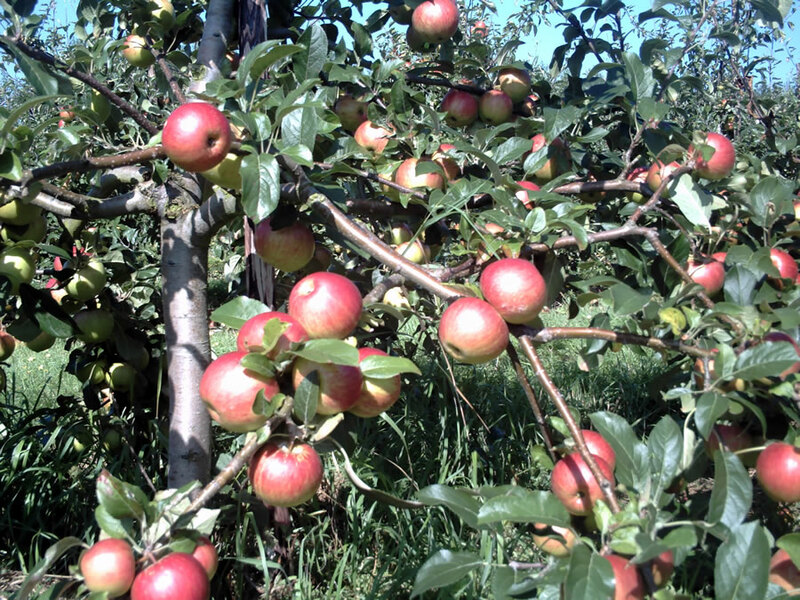 Many people would understandably like their trees to start producting fruit as soon as possible. A tree left to its own devices tends to grow wood instead of fruit over the first four years. This is understandable: the tree wants to create a firm structure before hanging lots of heavy fruit on it! This gives us a clue as how to proceed. First, get the tree growing as soon as possible. Second, don’t prune the young shoots, in order to encourage the formation of fruit buds. Third, encourage auxin production by the root system. Let’s look at these in more detail. We want the trees to achieve strong growth within months after planting, instead of years after planting. To promote strong growth early on, the tree should be planted in fresh soil, nutritionally well balanced and of a sandy loam nature with strong water holding capabilities. Interestingly, practical experience has shown that if trees are well supported, by a tall enough stake and/or interconnecting wires, the trees will crop significantly earlier. It’s as if the tree “senses” the degree of flexion of its branches and “decides” that the structure is strong enough to start fruiting. To develop tree structure in its early years, pruning must be kept to an absolute minimum in years 1, 2 and 3 after planting. Tree formation is therefore carried out with the aid of stakes and wires instead of a secateur. By not cutting into the young shoots, the formation of strong fruit buds will follow. All we have to do is to tie the newly formed cropping wood into a near horizontal position onto the wires, during the month of August. Cropping will start the following year. Obviously we have to aim to create the correct structure for the tree. This should be the form of a pyramid, in order to fully utilize the available light. Therefore at all times we have to maintain a leading central shoot, which initiate the pyramid structure. However, we can work on structure while the tree is cropping. This is the critical difference with respect to standard procedure. In the old days, one pruned during the first four years of the life of the trees, in order to manufacture a tree frame work. This stage was called the “tree formation stage”. Nowadays the emphasis is on early production and therefore minimal pruning. Pruning is therefore necessary in order to secure a decent frame work, but it should be minimal. This pruning must never be carried out in spring at the start of the growing season. Carry out all your essential pruning when the fruit buds have already been formed. This is at the end of the growing season. The month of August and early September is ideal for this purpose. But not later!! As mentioned above, the root systems of fruit trees will produce high levels of growth-promoting auxins, if the rooting environment, the soil, is conducive to this effect. More details in a later post!